This version of HB comes from the excellent film, HellBoy II: The Golden Army, directed by Guillermo Del Toro and starring Ron Perlman as the hero. Being a Mez-Itz figure, he's mostly a smooth vinyl figure with great paint details, safe for even the small kids to enjoy (mostly). However, HB differs from much of the Mez-Itz line in that he features several character-specific pieces. Unlike the smooth, bulb head on Mez-Itz, HB's head is sculpted with the addition of two stumps on his forehead, recreating his sawed off horns. Aside from those, the head is completely smooth. Of course, HellBoy couldn't be recreated with the same old Mez-Itz mold. 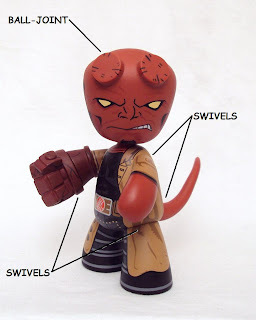 In addition to the unique features on his head, HB required a couple of new arm pieces for his "Right Hand of Doom" and a couple for his tail. His right arm is actually two new pieces: the shoulder piece with the base of his "Right Hand" and then the fist. The Hand of Doom is sculpted with plenty of blocky details to make it a nice representation of his stony hand. The tail is mainly one piece, however, they added a small piece that fit into the body and serves as the base for the tail. Because of the new pieces HB has a couple of extra articulation points compared to other Mez-Itz figures. In all he features seven points, but those points don't allow for many dynamic poses, unfortunately. The hip swivels are only slightly angled, so you can't even get him into a sitting pose. The angle of shoulder swivels allow him to raise his arms directly in front of his face. The addition of the right arm pieces add a new point, allowing the fist to swivel around 360 degrees. The tail also has full rotation making it an expressive body part. The range on the ball joint is fine and helps to HB a little more life on the shelf. Even with several new pieces, what would a HellBoy figure be without his trusty Samaritan pistol? Not a very effective demon hunter. Mezco threw in HB's favorite weapon for good measure. It's nicely detailed, albeit in the cutesy Mez-Itz fashion. HB can only hold it in his left hand because his right hand would probably crush it. It is bulky and can make for some awkward poses because of it's size. Also, it's heavy, so HB may topple over if you don't set him up in a solid stance. The paint on the Samaritan creates a worn look to it, appropriate for a weapon HB has lugged around since the 1940s (or whatever). The B.P.R.D. logo on the grip is sculpted in, with black paint rubbed in to bring out the details. As with all Mez-Itz figures, the true appeal is the awesome graphic designs on the figures. Creating a very stylized look to live-action characters. I hope you take some time to click on the images displayed here and check out the details on the paintwork because that's what vinyl figures are all about! HellBoy really shines in this format because the art on the figure is similar to HB creator Mike Mignola's style. There is a comic-based exclusive figure, which really captures the comic book version well, but HB is HB and this is a great representation of the character.